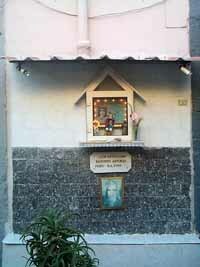 There are many hundreds of small shrines, such as the ones in these photos, in Naples, particularly in the older sections of the city; that is, the Sanità (the section in back of the National Museum on the way to the catacombs and the Capodimonte hill), the adjacent Vergini quarter, the Spanish Quarter (the square blocks on the west side of via Toledo/Roma), and the historic center of the city (bounded by the three east-west streets of "Spaccanapoli," via dei Tribunali, and via Anticaglia). The shrines are usually found embedded in the outer walls of dwellings to face on the street, but they may also be in courtyards or in stairwells within the buildings themselves. They almost all contain a religious image, perhaps a crucifix or an image of the Madonna or a saint, and some have dates telling you when they were put in place. (They may be quite recent; this is still quite a living tradition.) They are usually clean and well-maintained and may contain flowers and votive candles. There is usually an inscription saying that the shrine was erected per grazie ricevute (for grace received) or ex voto, in fulfillment of a vow. Shrines are certainly not new, nor are they confined to Christianity, much less the city of Naples; yet, their abundance in Naples is noteworthy and apparently has a precise historical origin. Gregorio Maria Rocco (1700-1782) was a Dominican friar known as a patron of the have-nots and who was apparently the prime mover in convincing Charles III of Bourbon to start building the massive (and never finished) Albergo dei Poveri (the Royal Poorhouse) in Naples. Rocco's other claim to fame in the history of the city, however, was the institution of precisely this tradition of shrines illuminated by oil lamps and candles in order to take back the dark alleys of mid-18th-century Naples from petty thieves, who were in the habit of stringing rope at ankle level across the way in order to trip their victims. At first, Rocco got the king to approve a number of straight good-old government-issue oil lamps. Ho-ho.They were promptly destroyed by thieves. Then, banking on the Neapolitan respect for and devotion to the saints of the city, he encouraged people to put up illuminated religious shrines. Tradition says that the institution of these shrines, in fact, did make the streets safer at night; the collective candlepower of all the shrines made it easier to see where you were going, and perhaps the "spiritual light" worked its will, as well. Even thieves, ever devout, were reluctant to violate the Seventh Commandment with the Virgin Mary staring down at them. He is referring to the historic center of Naples (this map), and a shop that makes a specific kind of wall shrine to “souls in purgatory" - anime purganti). 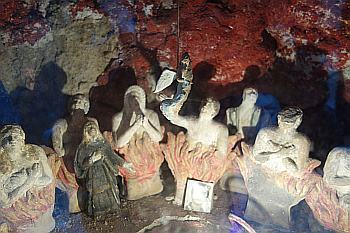 The proprietor of the the shop says that this particular kind of shrine originated at Pozzuoli and Lake Averno in the middle ages and that "by then [the Middle Ages]" the lake was a "purgatorial rather than a pagan" site." Is that possible? Maybe possible, but, at least in my view, not likely. The trick here, it seems to me, is to distinguish hell from purgatory. I asked my local goddess of research, Selene Salvi. She said, Socratically, that she knew nothing but then told me everything she didn't know. It's a lot and it's tricky. My correspondent's comment on the “ancient belief about the birds” refers to early Greek presence at Averno (c. 600 BC and the origin of the name Avernus. The name plausibly comes from the Greek "Aorno", meaning "without birds". The Greeks noticed that birds avoided flying above the lake, because of the very real stench of sulfur rising from the local subsoil and adjacent Solfatara volcano. That volcano, a popular tourist attraction, is a remnant of the ancient Campanian Ignimbrite eruption from 40,000 years ago. That event formed the entire area of the Campi Flegrei, the Fiery Fields. They are still Fiery and Brimstony, such that when the wind is blowing just wrong, even humans—forget the birds—don't much care for the place. But note that it is not just fearful; there is “a feeling of the sacred.” Just as sulfur/brimstone has medicinal and beneficial properties, so does fire. It cleanses, purifies. My lay anthropological understanding of the RC concept of Purgatory is that it was seen, at least originally, as an intermediate, temporary state after physical death, a state of non-Grace (meaning that your immortal soul was denied access to the glories of God and Heaven, while you were cleansed of your remaining small sins). But it was temporary; if you were in Purgatory, sooner or later, you would be in Heaven, with a little help from your friends. I repeat: Hell is bad. Purgatory is good. The changing view in RC theology of purgatory, though, has changed over the centuries and that may cause confusion. 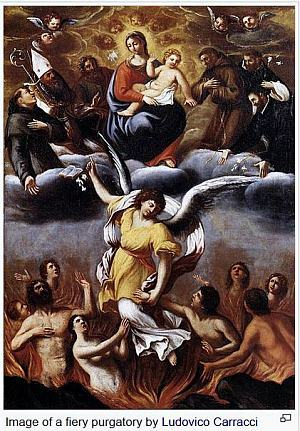 The common RC view, today, of purgatory is that it involves pain, suffering and cleansing fire, but these are not flames of eternal suffering and damnation; they are the cleansing fires that will eventually get you into paradise, exactly as depicted in the painting by Carracci (image, left). 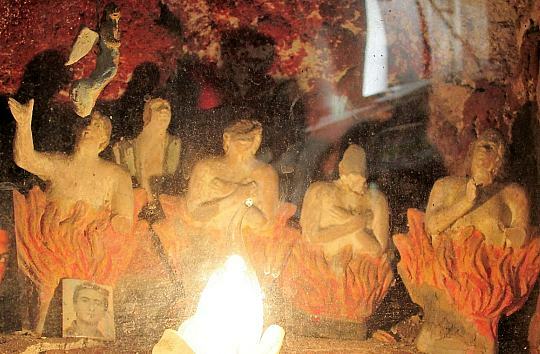 Images of souls in Purgatory start to become common after the 12th century. French anthropologists Jacque Le Goff presents the view that we have largely neglected the “Renaissance” of the 12th century. In his 1984 book The Birth of Purgatory, he says that the concept of purgatory as a physical place, rather than merely a state of non-Grace, dates to the 12th century. (All of the images on this page are since the 1200s). If that is true, then the local terracotta shrines to the souls of the deceased may indeed trace back to that period, but not necessarily to lake Avernus as the seat of Purgatory. I have really never seen those little shrines, but I found the addresses of some places that handle them and read that people have artisans fashion these small terracotta pieces in the image of their dearly departed. Then they place the pieces in niches by the roadside; passers-by, with their prayers, can thus help those who are being cleansed and facilitate their passage into Paradise. I can't tell you how far back the tradition goes, but it reminds me of similar small altars of the Lares of ancient Rome (small statuettes of terracotta, wood or wax that represent ancestors and are also placed in recessed niches. [ed.note - Tripergola (or Tripergole) was a village at Lake Averno destroyed by the sudden eruption of a new volcano in 1538, producing what has been called Monte Nuovo (New Mountain) ever since. Yet note that the Neapolitan historian, Mazzella, mentions Christ blocking the mouth of hell. There is no mention of Purgatory. Mazzella is recounting a legend that was at least 300 years old when he wrote it down in 1600. 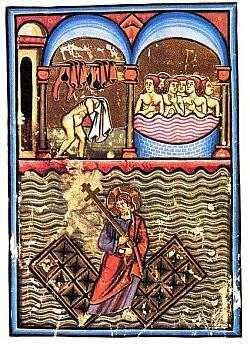 There is an extant 13th century miniature (image, right) in the Vatican library, an illustration of "De Balneis Puteolanis" by Peter of Eboli showing Christ smashing the gates of hell at Lake Avernus. * Gauro (or Barbaro) is the mountain seen here; ruins of the ancient church are still there. That mountain is the one referred to in: "...He and the Holy Fathers took that great mountain and blocked the mouth of Hell...". Thus Averno has always been seen as the entrance to the netherworld. Perhaps the source of the cult of the “anime purganti” is to be found in the ancient practice of the “refrigerium”. The refrigerium was not an ancient Roman refrigerator (!) BUT it has given us the word “refreshment”, a commemorative meal for the dead consumed in a graveyard. These meals were held on the day of burial and annually thereafter. Early Christians continued the refrigerium ritual, by taking food to gravesites. This connects the whole tradition of taking care of your ancestors, helping them “get settled in the afterlife”, as it were, to a worldwide and ancient tradition that even includes Buddhism. These little terracotta shrines are related to similar pre-Christian shrines in ancient Rome, as is the practice of saying prayers as you pass them in order to shorten the time that the souls of your dearly departed must spend before they may enter the presence of God. So my view is that while this tradition of terrcotta shrines of anime purganti may stem from the Middle Ages, the idea that they originated near lake Averno seems to me to very tentative. Perhaps someone has confused Purgatory with Hell. The photo on the left is at via Atri 4, the same location (from a slightly different angle) as the top photo from MK. They come from Neapolitan artist, photographer and great friend to this website, Fulvio De Marinis (info on him here) who went to stalk the wild soul in purgatory just for me. 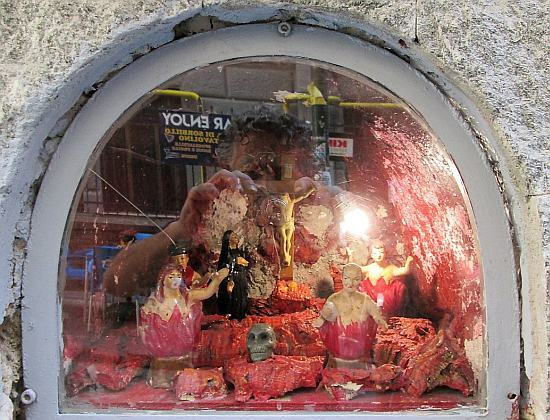 The difficulty of the photography is evident; both shrines are protected by glass and Fulvio apologized for the reflections...but he was smiling, perhaps because they do provide some mental reflections of their own. The second photo is at via Nilo 34 (both locations are in the ancient historic center near via dei Tribunali). The flash gives some additional "fire", but further, the image on the right shows clearly the reflected image of the photographer, as if he were one of the "souls in purgatory" shooting back at the mortal world, his recent past when he was alive. One last shot before settling in to await promotion to Paradise. Fulvio says he didn't do this on purpose, but he's an artist and will say anything!